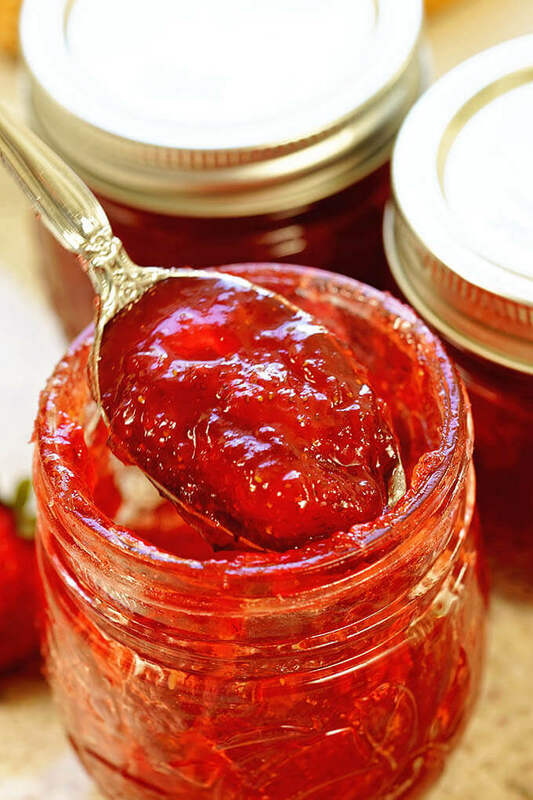 Homemade Strawberry Jam with sweet berries and tart lime makes the most amazing preserves! It’s easier to make than you think and once you make it you’ll never buy jam again! Mandarin Orange Jelly, Christmas in July Pepper Jam and Blueberry Pizzaz Jam are all requested! Everyone really loves homemade jams and jellies! My Aunts Barb and Shirley have been known to arm wrestle for it! I love that they really enjoy this treat and I never visit empty handed. This time I developed a new recipe that I’m excited to share and let me tell you, this one already has BIG stamps of approval from the friends that I’ve shared it with! 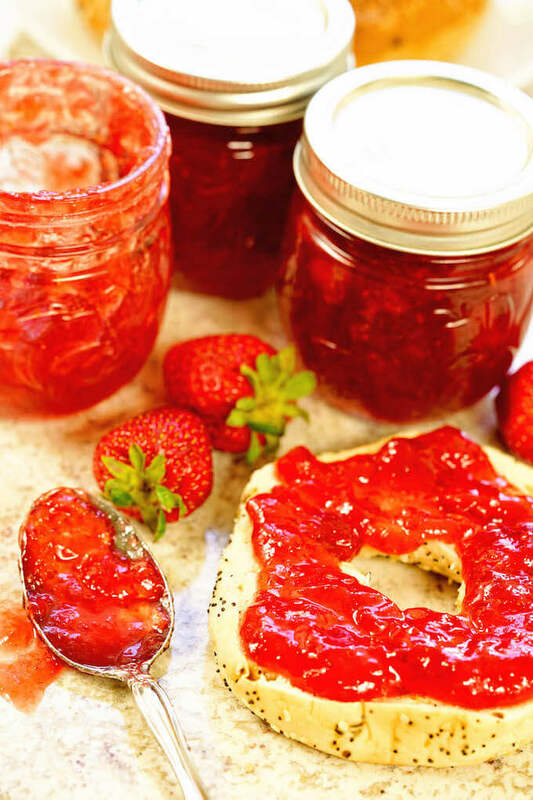 Sweet spring strawberries make the most delicious jam! How long has it been since you’ve done any canning? Has it been awhile? If so, now’s the time to jump back into jamming and let’s start by answering a few questions. Are preserves and jam the same thing? Pretty much, the names are used interchangeably. In both jam and preserves you’ll find pieces of fruit. Is jelly the same as jam? Nope, they are different! As I’d mentioned above jam contains pieces of fruit. Jelly is made from fruit juice. Why do you put lemon juice in strawberry jam? Lemon or lime juice is added when canning to prevent the growth of bacteria. 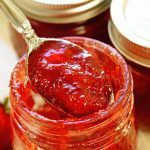 Is pectin necessary for jam? Pectin doesn’t preserve jelly or jam, but helps it jell so it isn’t too runny. For more information on making homemade preserves visit National Center for Home Food Preservation. Clean the fruit by soaking it. Using 1 part vinegar to 3 parts water, add the fruit and swish around really well. Never change the amount of sugar the recipe calls for. The sugar not only sweetens the fruit but also preserves it. 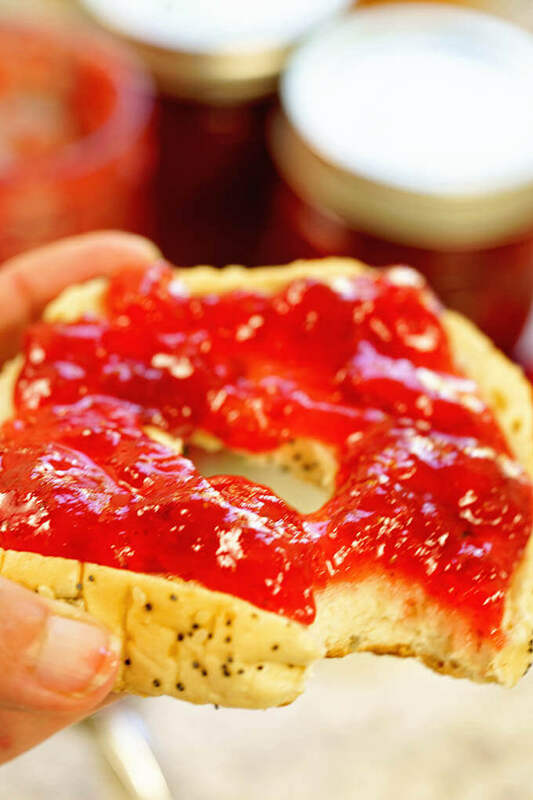 If you reduce the amount of sugar, you may end up with mold on top of the jam even though you’ve sealed it properly. Don’t change the amount of fruit – if you put in too little, it can get too thick, like paste! Too much fruit and it may not set and will be syrupy. Although the jars and rings are reusable, the lids are not. With something this delicious you’re going to want to enjoy every bite! I know you’re absolutely going to love this recipe! Jam making isn’t hard but you do have to be precise. When the recipe calls for boiling just one a minute, set a timer. Over processing can make the jam set incorrectly. And the longer it’s boiled the more flavor is removed from the fruit. If you like this jam, you’ll definitely want to try other jam recipes on my site like; Ja Makin’ Me Crazy Mango Jam (seriously delicious!) Bam Bam Pomegranate Jam (with a great POP of spice), or Low Sugar Blueberry Jam and this one is so easy my 10 year old niece made it! Grilling chicken, pork or shrimp? Jams and jellies are a flavorful quick and easy glaze. I use a spoonful in salad dressings to add great flavor! What if the jam doesn’t set? Label it as syrup and no one will be the wiser. Preserves make a great hostess gift! Clean and hull the strawberries (do not chop). Add the strawberries to a large heavy bottom pan. Using a potato masher, mash the berries well. Add the juice and zest of the lime and salt as called for in the recipe. Measure 1/4 cup of sugar and mix it with the contents of the Sure-Jell. Sprinkle it into the berry mixture and set it onto the burner on high and bring to a boil, stirring constantly. When it comes to a hard boil that you cannot stir down, add the remaining sugar. Stirring constantly, return it to a hard boil and boil exactly one minute. Remove from the heat and stir in the tequila. Immediately ladle into clean, sterilized jars. See it’s not hard to make! 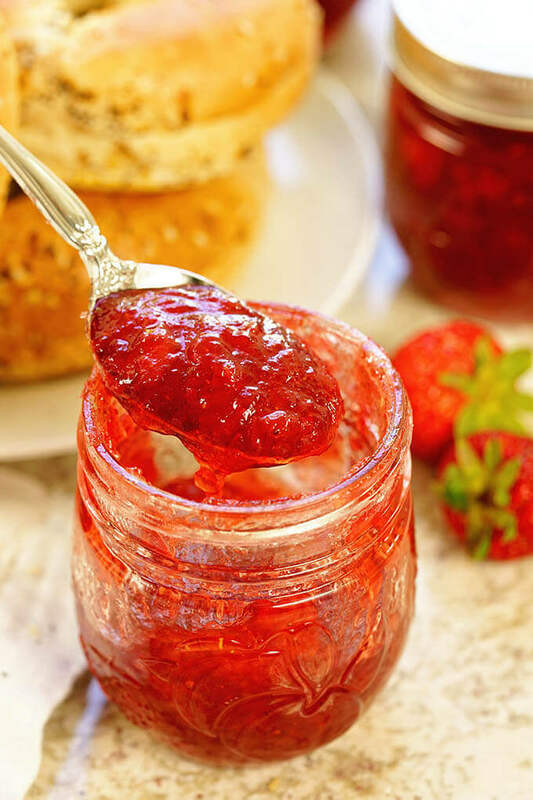 You’re going to be scraping the bottom of the jar as you enjoy every drop of this amazing jam! Try this recipe and love it? Please give me a five-star rating below, I sure would appreciate it! If you snap a photo and share it please tag me #bowlmeover or @bowl_me_over so I get to see your photos! Lastly, if you have any questions, don’t hesitate to comment below or email me debra@bowl-me-over.com. Sweet summertime berries, tart lime and the peppery bite of a great tequila combine to make the most delicious strawberry margarita jam! 1/4 cup tequila use good tequila! Clean the strawberries and remove the stems (do not chop). Mash the berries with a potato masher. Measure out exactly 5 cups of crushed berries. Add to a large heavy bottom pot. Measure 1/4 cup of sugar and mix it with the contents of the Sure-Jell. Sprinkle it into the berry mixture and set it on the burner. Turn on high and bring to a boil, stirring constantly. When it comes to a hard boil (one that you cannot stir down) add the remaining sugar. Return it to a hard boil and boil exactly one minute. Remove from the heat. With hot pan holders on immediately stir in 1/4 cup tequila. It will bubble and spit a bit! Continue to stir until it is completely incorporated, about a minute. Ladle into clean, sterilized jars. Using a paper towel clean the top of the jar off completely. Add the lid and screw top. Screw the lid on tightly. Process in a hot water bath for 10 minutes to seal. Remove from the hot water bath and place on a heat-proof surface. You'll hear the jars pop and you'll know they are sealed. This recipe makes 6 pints of jam. This recipe is genius! I LOVE the idea of adding the tequila to the jam! I’d never think of it, but it should come out so unique and delicious! It’s so good Liza – everyone’s favorite this year at the family reunion. I hope you give it a try! I would love to try margarita on toast, any day of the week! Such terrific flavors here!! This would be incredible on an english muffin in the morning! Absolutely, my Aunt went thru an entire jar over the weekend! How incredible is this!!!! I am loving the flavor of this jam and really excited to try your recipe! Wonderful, enjoy Angela! I’ve made this so many times now and it comes out prefect every time! I definitely prefer jam with real fruit over jelly! We are still going strong with fresh strawberries here in CA. I think I’ll make a couple of batches to give as gifts during the holiday season! Perfect! It’s the BEST gift (if you have any leftover!) Thank you Sandra! You had me at margarita jam! This is printed out and I am making this for the end of summer breakfast BBQ in our neighborhood! It sounds perfect for a gift for all the neighbors! Homemade Jam is the BEST gift Michele and so easy to make when berries are abundant. Enjoy Michele! Do you take orders?? This sounds absolutely delicious!! I’ve been known to yes! 😀 Enjoy Michaela! This recipe is so creative! Way to turn a simple jam into a fabulous and delicious treat! This is the way I will be making jam for sure! We just love this recipe, it’s super fun and so delicious! Enjoy Kathy! !